Ok! You spoke... we listened! 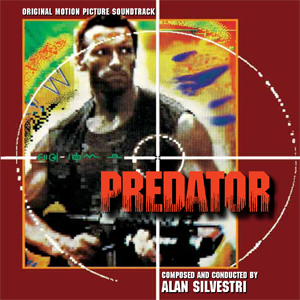 Completely re-mastered release of complete Alan Silvestri soundtrack for John McTiernan alien action movie with Arnold Schwarzenegger comes as both licensor (20th Century Fox) and composer seek re-release of wildly popular score to wider market. You asked for every drop of blood, we now give it to you. New CD restores tiny bits edited from earlier issue, removes select crossfades, includes brief cue "The Aftermath" prior to "End Credits". CD plays in chronological order as originally scored by composer. Silvestri's incredibly muscular score is dynamite example of scoring via small motifs. Rhythmic punctuation in low brass, melded with busy percussion figures, creates incredibly terse, aggressive foundation for melodic ideas in strings, upper brass. Another cool idea has heroic musical signature for Schwarzenegger anchoring score yet almost all motifs, ideas are rooted in minor harmonies, not the expected major. Resulting music remains grim, tough, violent throughout! Intrada MAF series release with modest enhancement to original graphic design by Joe Sikoryak plus reprise of informative liner notes from Julie Kirgo. Alan Silvestri conducts. Nothing needs to be said on this release, once sought after as one the most desirable scores... now you can have it... and you should have it. Alan Silvestri "Predator" is a masterpiece!